Sunnyhillboy, born on April 30, 2003, was purchased at the 2003 Tattersalls Ireland November sale for 10,000 euros by Timmy Hyde on behalf of leading owner J P McManus. He was sent into training with Jonjo O’Neill in Britain and made a winning debut in a bumper at Huntingdon in November, 2007, prior to finishing fourth on his hurdling debut at Doncaster in January, 2008. He was put away for the season and returned at Bangor in September, 2008, putting in a promising display to only be beaten half a length when third in a novices’ hurdle. Sunnyhillboy got off the mark in a handicap hurdle at Exeter the following month before two further victories on his next two outings at Cheltenham in November and Sandown in a Listed handicap hurdle. After three relatively quick runs, he was given a short break, returning for the Vincent O’Brien County Handicap Hurdle at the Cheltenham Festival, for which he was well fancied, but he failed to produce his best form and finished 25th of the 27 runners. However, he bounced back from that poor showing in the two and a half mile Listed Silver Cross Handicap Hurdle at the John Smith’s Grand National meeting, taking a competitive field apart to win by four lengths. He embarked on a chasing career in the 2009/10 season making his debut at Exeter in November but, despite strong market support, he could only finish fourth. With that run behind him, he got up late to win a two-mile novices’ chase at Lingfield three weeks later, but disappointed on his next two starts at Newbury in December and January where the heavy ground didn’t appear to suit. A return to better ground coupled with the fact it was his handicap chase debut at Ludlow saw him beat his 11 rivals snugly by half a length, before running well at the Cheltenham Festival to finish second in the Byrne Group Plate. On the back of that effort, he was fancied to go one place better in the Paddy Power Gold Cup at Cheltenham in November, 2010, but lack of race fitness told and he could only finish seventh. As in previous seasons, that first run seemed to bring him on and he ran better in the December Gold Cup back at Cheltenham where he was only beaten seven lengths in third by the classy Poquelin. Once again he was given a break and returned in March at the Cheltenham Festival, where he was sent off the 9/2 favourite for the JLT Specialty Chase, but a crashing fall at the seventh fence left favourite backers wondering what might have been. He then stepped up markedly in trip to contest the Irish Grand National on Easter Monday and, like at Cheltenham, he was the well-backed favourite but, after being settled towards the rear, he could never fully get into contention before staying on strongly for third. The Old Vic gelding returned last season over hurdles at Haydock in November, but could not get into the race until running on into seventh past beaten horses. After a disappointing run over fences at Cheltenham in December and a satisfactory display over hurdles at Haydock in February, he put himself in the Aintree picture with an impressive victory in the Fulke Walwyn Kim Muir Handicap Chase at the Cheltenham Festival. He ran a tremendous race at Aintree and looked the winner as he kicked two lengths clear on the run-in, but couldn’t resist the final thrust of Neptune Collonges and was beaten a nose – the shortest ever winning distance ever in the John Smith’s Grand National. This season has been geared around another tilt at the great race and he ran an eye-catching race first time out in the Betfair “Fixed Brush” Handicap Hurdle at Haydock on November 24, staying on to take fifth. He disappointed on his next outing in a Pertemps qualifier at Warwick on January 12 in very soft ground, when pulling up and was withdrawn from the Betfred Cheltenham Gold Cup on the morning of the race (March 15) following a bad scope. Few people have enjoyed a closer association with jump racing in the last 30 years than John Patrick ‘J P’ McManus, who was born on a farm in Co Limerick on March 10, 1951 and attended the Christian Brothers school on Sexton Street, Limerick. He left his father’s plant hire business at the age of 20 to become a racecourse bookmaker, but then took the less well-trodden route of gamekeeper-turned-poacher to be a professional punter. McManus recalls one of his first bets as being on Merryman II in the 1960 Grand National when he was just nine, but the bet that changed his life was £4 on Linden Tree in a Newmarket maiden in 1970, the horse winning at 100/8. He had another £4 on when Linden Tree won the Observer Gold Cup at 25/1, and £5 each-way at 33/1 for the Derby, when the horse beat all bar Mill Reef. The amount he wagered grew rapidly and he is still one of the highest-staking punters on the racecourse. Dubbed “the Sundance Kid” by journalist Hugh McIlvanney after a number of major gambles in the ring during the 1970s, he is also the biggest jump owner in terms of numbers in Britain, Ireland and France (some 300 horses spread over 50 trainers ran for him last season) after he purchased his first racehorse, Cill Dara, at the age of 26. He has a host of business interests including dealing on the financial markets from his Geneva, Switzerland base and part-ownership of the Sandy Lane Hotel in Barbados, where he also has a house. With John Magnier, he bought a 28.7% stake in Manchester United through the Cubic Expression company before subsequently selling out to US tycoon Malcolm Glazer in 2005. He was in the news shortly after that because of his stake in the pub and restaurant operator Mitchells and Butler. In 2012, the Sunday Times estimated McManus’ wealth at £471 million, making him the 14th richest person in Ireland. Since Mister Donovan landed the William Hill Supreme Novices’ Hurdle in 1982, he has enjoyed 38 other Cheltenham Festival successes, headed by the great three-time Champion Hurdle hero Istabraq. In 2010, he won a fourth Champion Hurdle with Binocular, while the 2012 Festival yielded five more successes headed by Synchronised’s gutsy success in the Betfred Cheltenham Gold Cup, but he had to wait to final day this year before gaining two successes. McManus does a lot of work for charity and his Pro-Am golf tournament, which takes place every five years and has raised over 95 million euros. Jonjo O’Neill (born April 13, 1952) was a highly successful jump jockey and has established himself at the top of the training ranks. In spite of an appalling list of injuries, he was champion jockey twice (1977/78 and 1979/80), and he set a then record for a season of 149 winners in his first championship year. The most sensational moment of his riding career came when he won the Cheltenham Gold Cup on Dawn Run in 1986 as the mare became the only horse to win that trophy after having previously taken the Champion Hurdle (1984), again with O’Neill in the saddle. He also won the Gold Cup on Alverton in 1979, though he had a dreadful record in the Grand National, in which he never completed the course in spite of having eight rides. He retired from the saddle at the end of the 1985/86 season and, having survived lymphatic cancer not long after that, started training near Penrith, Cumbria, in 1987. He forged a reputation with horses such as Vicario Di Bray, winner of the 1989 Champion Hurdle Trial at Haydock, and Legal Right, who landed the Grade Three Tripleprint Gold Cup at Cheltenham in 1999 and went on to capture the BGC Silver Cup at Ascot as well as the Grade Two Tommy Whittle Chase. He moved to his present base at Jackdaws Castle in Gloucestershire, not far from Cheltenham, when the yard was bought by owner J P McManus in 2001. In 2010, he finally broke his Grand National duck when saddling Don’t Push It to victory for McManus, who had been trying to win the race since 1982. 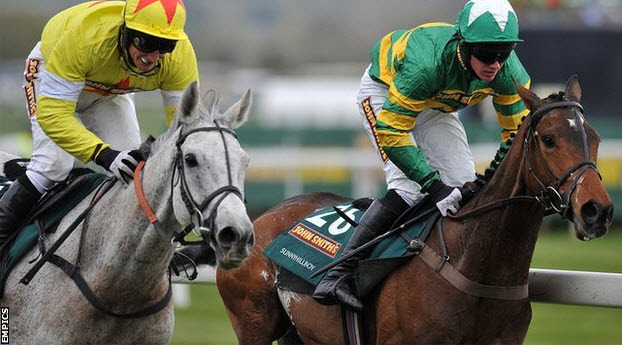 A P (Tony) McCoy rode the gelding, gaining a first success at the 15th attempt. O’Neill’s other victories at the Aintree Festival as a trainer include Quazar in the John Smith’s Anniversary 4YO Novices’ Hurdle in 2002, Clan Royal in the 2003 John Smith’s Topham Chase, Iris’s Gift (2003) and Black Jack Ketchum (2006) in the Sefton Novices’ Hurdle, Iris’s Gift in the 2004 John Smith’s Liverpool Long Distance Hurdle, Exotic Dancer (2007) in the Betfred Bowl and Albertas Run (2010) in the Melling Chase.